SmartCodeWebControl is a web control that allows you to easily add professional quality bar codes to ASP.NET applications. It is extremely powerful, utilizing the industry leading and awards-winning barcode software engine from TechnoRiver. If you use SmartCodeWebControl in your web applications, you can be assured that you will be generating barcodes that adhere to industry specifications! Simply insert SmartCodeWebControl into your web application and setup a few bar code properties, such as bar code height, bar width, barcode type and bar code orientation. Your desired bar codes will be generated automatically. Automatic barcode scanning adherence sizing - During resize, the barcode will be able to automatically adjust itself to adhere to industry specifications. Flexible sizing options - the X dimension, wide to narrow ratio, barcode height and several other properties may be adjusted for the intended application and scanning equipment. Complete UCC/EAN 128 Support - Support for all industry Application Identifiers. Multi Part Support - New! Checksum options - checksum characters can be enabled or disabled in the barcode. In the human readable text, checksum characters can be appended to the text. Barcode Rotation - angles of 0, 90, 180 or 270 are supported. 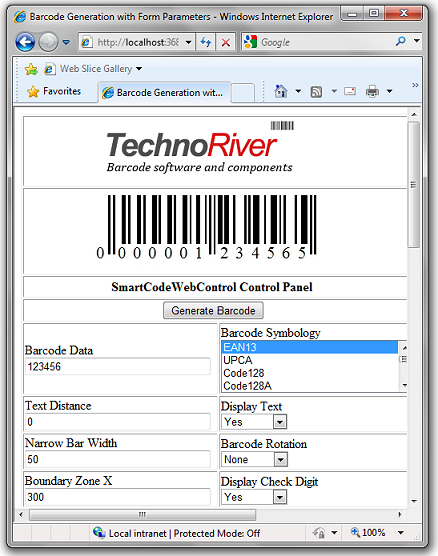 SmartCodeWebControl supports all commonly used bar code symbologies. QR Code (includes support for Kanji and JIS characters) - New! Micro QR Code - New! PDF417 (includes Truncation support) - New!